Did your favorite Kate Spade watch stop ticking? Don't worry! WatchGnome offers watch battery replacement for Kate Spade watches and makes it fast, easy and affordable. Unlike other watch shops, WatchGnome handles the whole process for you without you having to leave your house. Kate Spade Watch Battery Replacement: Hassle Free! You'll get your Kate Spade back in just a few days without ever having to leave your house! The company Kate Spade New York was founded in 1993 by Katherine Brosnahan and her husband Andrew Spade. Thus the name "Kate Spade" New York was started. The original idea occured when she walked around New York City and all she saw were boring. Kate and her husband decided “The nothing black bag” was going to become obsolete with their visions. The business started out with the "Sam handbag" and was only making lively, colored bags for consumers. Eventually, Andy withdrew $35,000 from retirement funds to start production of Kate’s handbags. Their debut line combined classic shapes, colors and fabrics into a now iconic square bag with a little black label sewn to the outside of the bag. That now famous label simply says “Kate Spade New York.” Their main target market at this time was the upper middle class. The company was doing well and in 1996, opened their first shop in New York City's SoHo neighborhood. Everywhere people went in New York from about 1997-2000, it would have been impossible to avoid seeing a few women carrying the iconic Nylon bag. Continuing to be a forward thinking business, Kate Space was one of the first of its time to go digital, by using iPads, cell phones, and computers, as a part of the daily routine when working at one of its stores. Although the company began with handbags, they expanded into many different accessory items including watches. Kate Spade Watch Battery Died? Don't worry, you've definitely come to the right place to get your Kate Spade battery running again. Our professional service will take just a few days and have it running like new. If your watch needs a little more love, we can help you there too with our watch glass repair service or general Kate Spade watch repair offerings. Who Replaces Kate Spade Batteries Near Me? The most common options for getting a new battery in your Kate Spade battery are a local jeweler or watch shop. If you live in urban areas this might be as close as 3-5 miles, but if you live in Suburban or Rural areas this could easily be a 15-30 mile drive. If you want to get your KS watch running perfectly again but would prefer not to drive, Watch Gnome is the perfect option for you. We handle the entire process via mail. Do it really get any closer to you than your own mailbox? It's like having a watch professional living right next door! Is It Expensive to Get A Kate Spade Battery Replaced By Mail? Not with Watch Gnome! Our online battery replacement service starts at just $20 for our Basic Service. Our Premium Kate Spade watch service is $30 and our Deluxe which gets it done with 2-day shipping in all direction. Other services will likely cost you between $20 and $60 dollars depending on where you live. 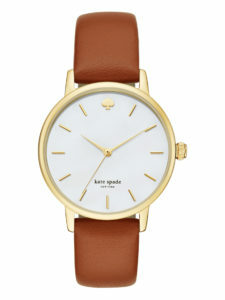 What Watch Battery Does My Kate Spade Need? It depends on which specific model you have but most Kate Spade's take either a 321 watch battery or a 364. Occasionally we see a 337 or 321. If you choose our battery change service, you don't need to worry about it. Our trained technicians know which battery your Kate Spade watch needs and will make sure to get the right once in!